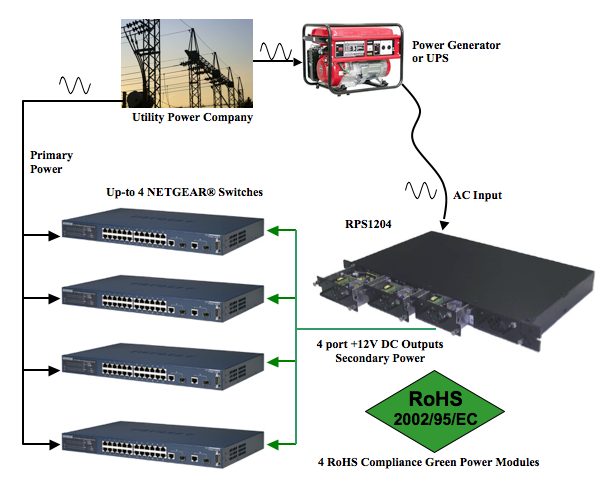 RPS Power Supply Series™ is a unique and a highly reliable power supply series. It is used as a redundant power supply for NETGEAR® RPS capable PoE, 10/100 Ethernet, and Gigabit Ethernet switches. The RPS Power Series™ is designed for Universal AC to DC power supply applications. Because of this feature these power supplies can be used anywhere in the world. The Model RPS1204 is a HOT-SWAP 1U rack mountable RPS (Redundant power supply) system. The RPS has 4 modules each capable of supporting a NETGEAR switch. The unique HOT- SWAP capability of RPS1204 gives the end user flexibility to change the configuration in field. The RPS Power Series™ is designed for Universal AC to DC power supply applications. Because of this feature these power supplies can be used anywhere in the world.